There is limited evidence to support how systematic reviews should be presented to enhance uptake in decision making. Despite advances in the conduct and reporting of systematic reviews, current evidence suggests that they may be used infrequently by clinicians, patients and others to make decisions. Because the reporting of systematic reviews tends to focus on methodological rigour more than clinical context, they often do not provide crucial information for clinicians. 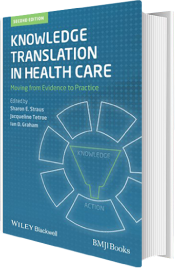 *For more information on knowledge synthesis, please refer to the full publication “Knowledge Translation in Health Care: Moving from Evidence into Practice” (2013).